Clallam County is located in the northern half of the Olympic Peninsula in the northwestern corner of Washington state. Its western side borders the Pacific Ocean and contains the westernmost point in the continental U.S., Cape Alava. The county’s northern border is across the Strait of Juan de Fuca from Vancouver Island, British Columbia. Its county seat and largest city is Port Angeles, directly south of Victoria, BC. The county is also home to the Makah Reservation of the Makah people. Clallam encompasses part of the Olympic National Forest and Park, making it a unique blend of mountain, ocean, forest, and rainforest. Cities and communities in Clallam County include Port Angeles, Sequim, Forks, Carlsborg, and Neah Bay. The total population is about 71,400 people. 3 Beds | 1.25 Baths | 3430 sq. Ft.
3 Beds | 2 Baths | 2252 sq. Ft.
3 Beds | 2 Baths | 1472 sq. Ft.
3 Beds | 3.5 Baths | 3275 sq. Ft.
3 Beds | 2.25 Baths | 1868 sq. Ft.
3 Beds | 3.25 Baths | 2744 sq. Ft.
3 Beds | 2 Baths | 2551 sq. Ft.
3 Beds | 2.75 Baths | 2964 sq. Ft.
Blue Summit Realty has the most accurate and up to date Clallam County real estate listings on the web. Currently there are 234 homes for sale, 3 condos for sale, 4 rental properties, and 302 vacant land properties in Clallam County. Of the 545 total Clallam County residential listings for sale 10 are bank owned, 0 are short sales and 35 are new construction and 0 are townhomes. The price ranges from $49,900 to $1,950,000 with a median list price of $410,977 and median sold price of $281,949. 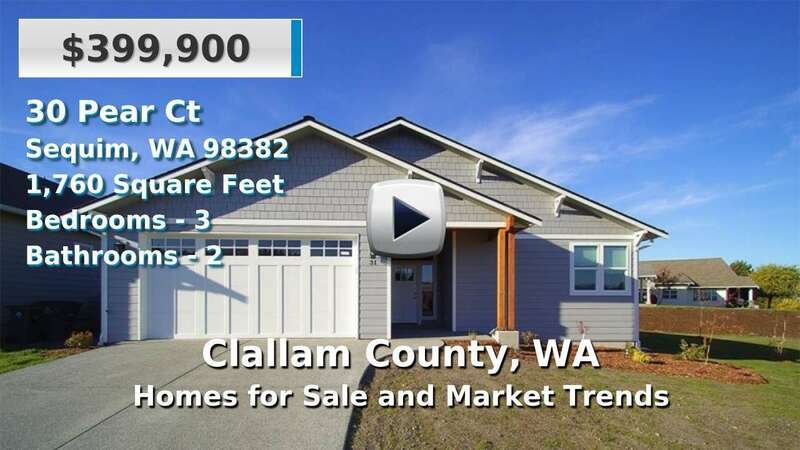 Make sure to refine your Clallam County real estate search by property type, price, square footage, bedrooms, bathrooms and more with the search tool above or view the Clallam County listings on our interactive map. Our Clallam County real estate listings were updated 10 minutes ago.